Update: Fixed the pages and silly HTML typos. Added missing events (dual blade mastery books event!) and other info you guys told me I forgot. As you may have already heard from other sources (or me! 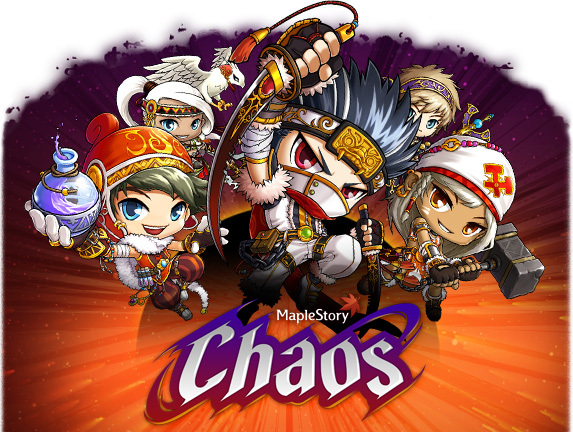 ), Chaos was a big update that hit KMS a while ago. Note that IT’S NOT NEW, IT CAME LONG BEFORE JUMP!. I know I blogged about Jump! already, but I promised to make a Chaos guide before it hits GMS. And it hits GMS very soon! On June 29th~! So let’s begin. – Age of Hero, December 16th in KMS and June 19th in GMS. – Age of Artisans, December 30th in KMS and July 11th in GMS. – Age of Battle, January 13th in KMS and July 20th in GMS. – Ice Knight, July 27th in GMS. – Age of Triumph, Exclusive GMS content. What is it? Find out here! And hey, did you notice that Nexon made it start at exactly version 0.99? Yay! NOTE: Sorry but all the videos I kept of Chaos got deleted when my external drive was freeing space on its own 😦 (some pictures too). I’ll shoot some videos of my characters (even though I kept videos from earlier levels, which I wanted to show you :O) and upload them later! Before I actually start talking about what happened in the first part of Chaos, I’ve got to tell you what happened beforehand. Oh no it’s terrible! And it went on for a month! Then, one day, Nexon announced about the Chaos update. It was really unexpected, and they released it about a week or so after they announced it. It already happened in GMS as I told you a little while ago. Also, everywhere you’ll look you’ll see the Dual Blader. The reason is because he’s their so-to-speak ‘leader,’ and he’s the bravest and strongest one of them all. That’s also why they got buffed the most. Anyway, I’ll tell you what basically happened. Aside from a new server (named Chaos) being released, what happened was a major revamp. The revamp changed every job in MapleStory, especially the ones that were removed (and Dual Blades). Here are the changes made in Chaos. These changes are the changes from present day GMS to KMS v.1.2.128, the official end of Chaos in KMS. It’s also the same as GMST v.06. Damage Decreased (250% damage at max level -> 180% damage at max level). Range Decreased (250% -> 200%). Damage Increased (240% damage at max level -> 280% damage at max level). Damage Over Time Increased (50% damage at max level -> 100% damage at max level). Damage Over Time Duration Increased (3 seconds at max level -> 8 seconds at max level). Damage Increased (600% damage at max level -> 750% damage at max level). Amount of Enemies Hit Increased (3 at max level -> 6 at max level). Required MP Increased (18 MP at max level -> 27 MP at max level). Required MP Increased (12 MP at max level -> 24 MP at max level). Amount of HP absorbed Increased (2% at max level -> 5% at max level). Amount of Enemies Hit Increased (4 at max level -> 6 at max level). Required MP Increased (15 MP at max level -> 35 MP at max level). Range Decreased (600% -> 500%). Accuracy Bonus Doubled (+60 accuracy at max level -> +120 accuracy at max level). Damage Increased (210% at max level -> 225% at max level). Required MP Raised (24 MP at max level -> 50 MP at max level). Range Increased (270% -> 320%). Damage Increased (460% damage at max level -> 510% damage at max level). Damage Increased by 5% (280% damage at max level -> 285% damage at max level). Skill Duration Decreased (300 sec. at max level -> 240 sec. at max level). Magic DEF Increase Doubled (100 accuracy at max level -> 200 accuracy at max level). Damage Increased (145% damage at max level -> 170% damage at max level). Damage Increased (360% damage at max level -> 410% damage at max level). Damage Formula Changed; Instead of being 690% for all levels, it will only be 690% when maxed. Attacks 10 monsters instead of 15. Weapon/Magic DEF Bonus Increased (+300 Weapon/Magic DEF at max level -> +500 Weapon/Magic DEF at max level). Accuracy/Avoidability Bonus Increased (+120 Accuracy/Avoidability at max level -> +300 Accuracy/Avoidability at max level). Duration Decreased (300 seconds at max level -> 240 seconds at max level). Magic DEF Bonus Increased (+120 Magic DEF at max level -> +225 Magic DEF at max level). MP Absorbtion Chance Decreased (30% chance at max level -> 20% chance at max level). MP Absorbtion Amount Decreased (40% of the enemy’s MaxMP absorbed at max level -> 10% of the enemy’s MaxMP absorbed at max level). Required MP Increased (50 MP at max level -> 65 MP at max level). Damage Increased by 100% (130% damage at max level -> 230% damage at max level). Damage Over Time Increased by 20% (160% damage at max level -> 180% damage at max level). Damage Increased by 100% (500% damage at max level -> 600% damage at max level). Damage Increased by 105% (475% damage at max level -> 580% damage at max level). Required MP increased by 10 (52 MP at max level -> 62 MP at max level). Effect’s delay decreased by 100 milliseconds (820 milliseconds -> 720 milliseconds, note that the effect means the fire behind you, not the circle or the animation of hitting the monster. Not such a big deal). Damage Increased by 140% (290% damage at max level -> 430% damage at max level). Damage Increased (620% damage at max level -> 770% damage at max level). Damage Over Time Decreased by 20% (160% damage at max level -> 140% damage at max level). Damage Increased by 200% (1500% damage at max level -> 1700% damage at max level). Damage Increased (450% damage FOR ONE HIT at max level -> 145% damage PER HIT at max level). Attacks 4 times instead of once. Time Frozen Increased [by one second] (2 seconds at max level -> 3 seconds at max level). Damage Increased (140% damage at max level -> 155% damage at max level). Damage Increased (560% damage at max level -> 625% damage at max level). Damage Increased by 140% (260% chance at max level -> 400% chance at max level). Damage Increased by 110% (740% chance at max level -> 850% chance at max level). Damage Increased by 200% (1400% chance at max level -> 1600% chance at max level). Required MP Raised (24 MP at max level -> 25 MP at max level). Accuracy/Avoidability Bonus Tripled (+60 Accuracy/Avoidability at max level -> +180 Accuracy/Avoidability at max level). Weapon Attack Bonus stayed the same. Weapon/Magic DEF Increased (+120 Weapon/Magic DEF at max level -> +300 Weapon/Magic DEF at max level). Damage Increased (430% damage at max level -> 580% damage at max level). Damage Increased (310% damage at max level -> 410% damage at max level). Required MP Increased by 10 (46 MP at max level -> 56 MP at max level). Damage Increased by 180% (720% damage at max level -> 900% damage at max level). Damage Increased by 130% (470% damage at max level -> 600% damage at max level). Damage Increased by 200% (1700% damage at max level -> 1900% damage at max level). Accuracy/Avoidability Bonus Increased (+80 Accuracy/Avoidability at max level -> +225 Accuracy/Avoidability at max level). Damage stayed the same AT MAX LEVEL. Damage Increased by 30% (150% damage at max level -> 180% damage at max level). Effect’s delays lowered by 90 milliseconds (900 milliseconds -> 810 milliseconds). Damage Increased by 100% (400% damage at max level -> 500% damage at max level). Damage Increased by 20% (200% damage at max level -> 220% damage at max level). Damage Increased by 110% (210% damage at max level -> 320% damage at max level). Damage Increased by 30 (150% damage at max level -> 180% damage at max level). Damage Increased (200% damage at max level -> 225% damage at max level). Required MP Raised by 40 (10 MP at max level -> 50 MP at max level). Accuracy/Avoidability Bonus Increased (+60 Accuracy/Avoidability at max level -> +160 Accuracy/Avoidability at max level). Required MP stayed the same AT MAX LEVEL. Damage Increased by 50% (350% damage at max level -> 400% damage at max level). Damage Increased by 43% (250% damage at max level -> 293% damage at max level). Damage Increased by 40% (395% damage at max level -> 435% damage at max level). Damage Increased (600% damage at max level -> 670% damage at max level). Damage Increased by 40% (560% damage at max level -> 600% damage at max level). Accuracy/Avoidability Bonus Increased (+120 Accuracy/Avoidability at max level -> +160 Accuracy/Avoidability at max level). Amount of Enemies Hit changed from 3~6 to 6. Damage Increased by 10% (215% damage at max level -> 225% damage at max level). Stun Duration Increased (2 seconds at max level -> 3 seconds at max level). Effect’s Delays Decreased (1260 milliseconds -> 870 milliseconds). Weapon/Magic DEF Bonus Increased (+60 Weapon/Magic DEF at max level -> +200 Weapon/Magic DEF at max level). Damage Increased by 150% (600% damage at max level -> 750% damage at max level). Effects’ Delays Decreased (1380 milliseconds -> 870 milliseconds till first rock, 1050 milliseconds -> 630 milliseconds for each rock, delay of the next rock’s arrival: 150 milliseconds -> 90 milliseconds). Accuracy/Avoidability Bonus Increased (+100 Accuracy/Avoidability at max level -> +300 Accuracy/Avoidability at max level). Damage Increased by 180% (500% damage at max level -> 680% damage at max level). Damage Increased by 200% (780% damage at max level -> 980% damage at max level). Weapon/Magic DEF Bonus Increased (+140 Weapon/Magic DEF at max level -> +300 Weapon/Magic DEF at max level). Damage Increased by 30% (410% damage at max level -> 440% damage at max level). Damage Increased (700% damage at max level -> 850% damage at max level). Effects’ Delays Decreased (1590 milliseconds -> 1440 milliseconds, just the first 3 frames and the last one lowered by 30 milliseconds so every frame is now 90 milliseconds). Damage Increased by 38% (362% damage at max level -> 400% damage at max level). Damage Increased (620% damage at max level -> 760% damage at max level). Damage Increased by 30% (155% damage at max level -> 185% damage at max level). Damage Decreased by 50% (160% damage at max level -> 110% damage at max level). Range increased lengthwise and decreased heightwise. Damage Decreased by 25% (110% damage at max level -> 85% damage at max level). Damage Decreased (230% damage at max level -> 190% damage at max level). Required MP Decreased by 20 (40 MP at max level -> 20 MP at max level). Damage Increased by 50% (250% damage at max level -> 300% damage at max level). Required MP Decreased (22 MP at max level -> 16 MP at max level). Damage Increased by 10% (290% damage at max level -> 300% damage at max level). Amount of Enemies Hit stayed the same AT MAX LEVEL. Max Level: 20 -> 5. Required MP: 90 at max level -> 65 at max level. Everything else stayed the same AT MAX LEVEL. Max Level: 20 -> 15. Required MP: 12 at max level -> 25 at max level. Damage: 250% damage at max level -> 240% damage at max level (-10%). Required MP: 40 -> 45. Attacks once instead of twice. Required MP Increased (44 MP at max level -> 50 MP at max level). Damage Increased (420% damage FOR ONE HIT at max level -> 255% damage PER HIT at max level). Hits twice instead of once. Max Level: 20 -> 10. Probability stayed the same AT MAX LEVEL. There’s a chance (the probability^) that your Dark Site won’t go off when you’re attacked. Instead, there’s a chance (20% at max level) that your Dark Site will be re-activated and your damage will increase (by 10% at max level). Damage Bonus Duration Increased (bonus for 10 attacks at max level -> bonus for 13 attacks at max level). Damage Decreased (420% damage at max level -> 280% damage at max level). Max level: 30 -> 20. Damage: 285% damage at max level -> 80% damage at max level. Required MP: 80 -> 75. Critical Rate: 20% at max level -> always 100%. Everything else is the same AT MAX LEVEL. Description: Has a chance of recovering HP when attacking. However, cannot recover your HP if you have 15% or more HP of your MaxHP. Equation: Has a RoundUp(x / 2)% chance to recover x% HP. Level 1: Has a 1% chance to recover 1% HP. Level 2: Has a 1% chance to recover 2% HP. Level 3: Has a 2% chance to recover 3% HP. Level 4: Has a 2% chance to recover 4% HP. Level 5: Has a 3% chance to recover 5% HP. Level 6: Has a 3% chance to recover 6% HP. Level 7: Has a 4% chance to recover 7% HP. Level 8: Has a 4% chance to recover 8% HP. Level 9: Has a 5% chance to recover 9% HP. Level 10: Has a 5% chance to recover 10% HP. Required HP Decreased (45% HP at max level -> 20% HP at max level, also it’s going down instead of going up as you put SP into the skill). Attack Bonus Decreased (+200% attack at max level -> +140% attack at max level). Attack Bonus Duration Decreased (44 seconds at max level -> 40 seconds at max level). Damage of Fatal Blow, Slash Storm, Tornado Spin, Bloody Storm, Upper Stab, and Flying Assaulter Increasing Feature Removed. Has a chance to instantly kill the monster (15% at max level). Required MP Increased (40 MP at max level -> 60 MP at max level). Damage Increased (1380% damage at max level -> 1650% damage at max level). No longer a party skill, only for yourself. Increases your damage (by 30 attack at max level) and has a chance to prevent you from being knocked back (90% chance at max level). Required MP: 350 at max level -> 90 at max level. Duration: 160 seconds -> 210 seconds. Description: Grants a higher chance of getting critical attacks. Description: Spin Rapidly and attack the enemy. Equation: MP Cost: 40 + 5 * Int(x / 6), Damage: 135 + x%, Attacks up to 3 + Int(x / 10) monsters 3 times. Level 1: MP Cost: 40, Damage: 136%, Attacks up to 3 monsters 3 times. Level 2: MP Cost: 40, Damage: 137%, Attacks up to 3 monsters 3 times. Level 3: MP Cost: 40, Damage: 138%, Attacks up to 3 monsters 3 times. Level 4: MP Cost: 40, Damage: 139%, Attacks up to 3 monsters 3 times. Level 5: MP Cost: 40, Damage: 140%, Attacks up to 3 monsters 3 times. Level 6: MP Cost: 45, Damage: 141%, Attacks up to 3 monsters 3 times. Level 7: MP Cost: 45, Damage: 142%, Attacks up to 3 monsters 3 times. Level 8: MP Cost: 45, Damage: 143%, Attacks up to 3 monsters 3 times. Level 9: MP Cost: 45, Damage: 144%, Attacks up to 3 monsters 3 times. Level 10: MP Cost: 45, Damage: 145%, Attacks up to 4 monsters 3 times. Level 11: MP Cost: 45, Damage: 146%, Attacks up to 4 monsters 3 times. Level 12: MP Cost: 50, Damage: 147%, Attacks up to 4 monsters 3 times. Level 13: MP Cost: 50, Damage: 148%, Attacks up to 4 monsters 3 times. Level 14: MP Cost: 50, Damage: 149%, Attacks up to 4 monsters 3 times. Level 15: MP Cost: 50, Damage: 150%, Attacks up to 4 monsters 3 times. Level 16: MP Cost: 50, Damage: 151%, Attacks up to 4 monsters 3 times. Level 17: MP Cost: 50, Damage: 152%, Attacks up to 4 monsters 3 times. Level 18: MP Cost: 55, Damage: 153%, Attacks up to 4 monsters 3 times. Level 19: MP Cost: 55, Damage: 154%, Attacks up to 4 monsters 3 times. Level 20: MP Cost: 55, Damage: 155%, Attacks up to 5 monsters 3 times. Level 21: MP Cost: 55, Damage: 156%, Attacks up to 5 monsters 3 times. Level 22: MP Cost: 55, Damage: 157%, Attacks up to 5 monsters 3 times. Level 23: MP Cost: 55, Damage: 158%, Attacks up to 5 monsters 3 times. Level 24: MP Cost: 60, Damage: 159%, Attacks up to 5 monsters 3 times. Level 25: MP Cost: 60, Damage: 160%, Attacks up to 5 monsters 3 times. Level 26: MP Cost: 60, Damage: 161%, Attacks up to 5 monsters 3 times. Level 27: MP Cost: 60, Damage: 162%, Attacks up to 5 monsters 3 times. Level 28: MP Cost: 60, Damage: 163%, Attacks up to 5 monsters 3 times. Level 29: MP Cost: 60, Damage: 164%, Attacks up to 5 monsters 3 times. Level 30: MP Cost: 65, Damage: 165%, Attacks up to 6 monsters 3 times. Description: Strikes a deadly series of damage on the enemy ahead. In addition, monster’s defense can be ignored. Equation: MP Cost: 30 + 2 * Int(x / 5), Damage: 75 + x%, Ignores 5 + RoundUp(x / 2)% of the enemy’s defense, Attacks the enemy 6 times. Level 1: MP Cost: 30, Damage: 76%, Ignores 6% of the enemy’s defense, Attacks the enemy 6 times. Level 2: MP Cost: 30, Damage: 77%, Ignores 6% of the enemy’s defense, Attacks the enemy 6 times. Level 3: MP Cost: 30, Damage: 78%, Ignores 7% of the enemy’s defense, Attacks the enemy 6 times. Level 4: MP Cost: 30, Damage: 79%, Ignores 7% of the enemy’s defense, Attacks the enemy 6 times. Level 5: MP Cost: 32, Damage: 80%, Ignores 8% of the enemy’s defense, Attacks the enemy 6 times. Level 6: MP Cost: 32, Damage: 81%, Ignores 8% of the enemy’s defense, Attacks the enemy 6 times. Level 7: MP Cost: 32, Damage: 82%, Ignores 9% of the enemy’s defense, Attacks the enemy 6 times. Level 8: MP Cost: 32, Damage: 83%, Ignores 9% of the enemy’s defense, Attacks the enemy 6 times. Level 9: MP Cost: 32, Damage: 84%, Ignores 10% of the enemy’s defense, Attacks the enemy 6 times. Level 10: MP Cost: 34, Damage: 85%, Ignores 10% of the enemy’s defense, Attacks the enemy 6 times. Level 11: MP Cost: 34, Damage: 86%, Ignores 11% of the enemy’s defense, Attacks the enemy 6 times. Level 12: MP Cost: 34, Damage: 87%, Ignores 11% of the enemy’s defense, Attacks the enemy 6 times. Level 13: MP Cost: 34, Damage: 88%, Ignores 12% of the enemy’s defense, Attacks the enemy 6 times. Level 14: MP Cost: 34, Damage: 89%, Ignores 12% of the enemy’s defense, Attacks the enemy 6 times. Level 15: MP Cost: 36, Damage: 90%, Ignores 13% of the enemy’s defense, Attacks the enemy 6 times. Level 16: MP Cost: 36, Damage: 91%, Ignores 13% of the enemy’s defense, Attacks the enemy 6 times. Level 17: MP Cost: 36, Damage: 92%, Ignores 14% of the enemy’s defense, Attacks the enemy 6 times. Level 18: MP Cost: 36, Damage: 93%, Ignores 14% of the enemy’s defense, Attacks the enemy 6 times. Level 19: MP Cost: 36, Damage: 94%, Ignores 15% of the enemy’s defense, Attacks the enemy 6 times. Level 20: MP Cost: 38, Damage: 95%, Ignores 15% of the enemy’s defense, Attacks the enemy 6 times. Level 21: MP Cost: 38, Damage: 96%, Ignores 16% of the enemy’s defense, Attacks the enemy 6 times. Level 22: MP Cost: 38, Damage: 97%, Ignores 16% of the enemy’s defense, Attacks the enemy 6 times. Level 23: MP Cost: 38, Damage: 98%, Ignores 17% of the enemy’s defense, Attacks the enemy 6 times. Level 24: MP Cost: 38, Damage: 99%, Ignores 17% of the enemy’s defense, Attacks the enemy 6 times. Level 25: MP Cost: 40, Damage: 100%, Ignores 18% of the enemy’s defense, Attacks the enemy 6 times. Level 26: MP Cost: 40, Damage: 101%, Ignores 18% of the enemy’s defense, Attacks the enemy 6 times. Level 27: MP Cost: 40, Damage: 102%, Ignores 19% of the enemy’s defense, Attacks the enemy 6 times. Level 28: MP Cost: 40, Damage: 103%, Ignores 19% of the enemy’s defense, Attacks the enemy 6 times. Level 29: MP Cost: 40, Damage: 104%, Ignores 20% of the enemy’s defense, Attacks the enemy 6 times. Level 30: MP Cost: 42, Damage: 105%, Ignores 20% of the enemy’s defense, Attacks the enemy 6 times. can’t wait to read this.. looks really good! Great guide. Lots of information in one place rather than scattered all across the internet, just what we need. Please change the colour on the red / blue pictures becuase it’s sorta giving me a seziure. Thanks! Me too LOL. I’ll see what I can do. just wanted to mention that for evan, magic shield always had a cool down on it (60 sec I believe), so the coold down chaos brings shortens the cool down. LOL that’s the one I was too lazy to double check… I’ll change it tomorrow, thanks for reporting. Guys sorry I REALLY messed up on this one. I spy a lot of errors too, but I’ll fix them tomorrow (with a computer and not a freaking iPod Touch!). First time I had to use more than 1 page. And it’s 10 pages now. Hey, are you sure about the DB Mask (new) + Evan Glasses (new) + Adventurer’s Ring (new) can stack together? Okay so in GMST, I PVPed to try and get a “Battle Pouch: Pouch available for purchase with a Gallant Emblem. No one knows what’s inside.” It gave 3 yellow magic powders (those maker things for yellow equips, useless). So I would imagine it just gives you random useless crap, but it isn’t worthwhile. Also, I was wondering if you could tell me when we would get the pocket slot, since in GMST if you bought items for the pocket slot, they couldn’t be equipped. Thanks! You should get the pocket slot when PvP comes to GMS or even sooner. I believe it changed to mirror the damage given instead of the damage range. Thanks, I’ll look into that. It’s probably not in the WZ so I’ll have to ask around. WOW! Awesome guide Shakar! you’ve really outshone yourself here! Brilliant! Would a [New] Resistance Ring + [New] Adventurer’s Critical Ring stack? Amazing guide shakar!! And aww no free db mastery books :(.. I don’t know about that. I didn’t write that because yes it happened in KMS but people told me we’re not getting it in GMS. We’ll have to wait till Chaos! I really hope there will be that event, though. Actually, never mind. The data is in the WZ so I believe the event will actually happen! Whoops I forgot o_o Thanks for reporting! Umm where the guide u said that u need 20 something for advancement Only for CK at omega sector? wow, the old resistance ring won’t stack with the new dual blade mask? that’s bs. Are all the skill icons for like dual blades going to change they seem very nice and improved. I HIGHLY doubt GMS will get the ” rebirth system”, If they scraped it then; there is No reason why any other Version would get it. I just see no reason for it, More logical “exclusive content” would be something tailored for the GMS players. Nice guide man. imo the profession event 2 is awesome lol. Any tips on how to get a secondary stat lved up faster (for a jewel crafter)? I know you mentioned making lv 40-60 items for it, but any idea which one would be best? Also, about the androids that come if you pick Blacksmithing, can they wear potential items which add on to your own stats? They cannot be potential’ed as far as I know. Excellent read 😀 I just have 1 little question, did you ever get your secondary profession in KMS? If so how long did it take you? If not, what strategy would you recommend to get to lvl 10 during the event time? I never got it to level 10, but that’s because I had school and other stuff to do during that time period. I also found a very good place and gathered some tips which you can see under ‘Any tips?’ section or something like that on the second part of this guide. Oh dear, if we got Rebirth, I might actually have a real purpose for wearing my Gellerhead Shield. I’m definitely interested to see any alternate ways of obtaining the level 140 equips. I think we all know that Cygnus is not going to be legitimately killed for a good long time. Well, I don’t know a whole lot about Dual Blades, but from my experience, they can’t take too much damage (unlike, say, a Hero). So that leads me to believe that the lack of defensive measures would lead to an expedition’s downfall. But that’s just my live of thought processing, though in theory, an offense faster than the opposition’s could be victorious if it were fast enough. Ooooh, thank you very much! I will definitely be forging them. Are there Wheels of Destiny in GMS? If there are, then they’ll easily defeat it. Wheels work in that map~ Again, that DB who solo’ed PB always had tons of wheels when she fought bosses. Hi. I have a question. If I create an equip blacksmithing, that equip will be tradeable or untradeable? For example, I want to create a lvl 80 hat and pass it to my other character. Can I do that? It’s a nice guide but yes Masteria IS GMS exclusive. It was made in GMS just like Neo Tokyo is JMS exclusive. Just because other versions have it doesn’t mean it’s any less exclusive. If it is a Masteria update then Masteria will be GMS exclusive in the traditional way meaning no one else has it like we do and that’s actually true now. MSEA and EMS Masteria is a little different then ours and if anyone’s hoping for the rebirth system don’t get your hopes up.. Someone has pointed out that Wild-Hunters get a level 1 (1st job i assume) skill called “Nature’s Balance” which may heal 10% of the hp/mp at a 20% chance. the PVP skill has 5% healign capacity. and THANK YOU for this entry. It’s a PvP ONLY skill. I didn’t add those skills, every class got new skills for PvP. If I make a PvP skill database (well, changes), then I’ll post all those skills. Really great job on this post, a few mistakes but other then that really good and extreamly informative, i look forward to reading about more of the kmst events, i really want to learn about this new dual bow Legend, and the new warrior Resistance, looks forward. Damn it, I thought that old would stack with new… sigh* Looks like I’ll make a Resistance mule. Have u realized the Mechanics and Dual Blade r hugely reduced in this update? Now I’m in a good frame of mind to delete my Mechanic and b a Wild Hunter…..
Wow, I totally forgot about that. They can be made using Smithing and the recipes are also sold by Larson. Also, about the Boom Up event; when the new character gets to level 30, what type of hairstyle and face coupon do they get? VIP or REG/EXP? EXP of course, otherwise I wouldn’t choose that crazy hair on my Aran! Is there a video of that girl soloing Pink Bean? I don’t believe so, but there’s a picture. will the accuracy formula change, needed more dex for warriors? Updated, fixed some stuff up~! u said : the Adventurer Rings (which you may only choose one of) are the same exact rings as the ones from the older event. That means, if you got one from the level 50 event thing in the past, it will stack with everything you get here! does that mean i can have 2 aventurer rings? i mean i already have an OLD aventurer critical ring, and do they stack if i get a NEW aventurer critical ring? OLD critical ring + NEW critical ring = ??? Nope but anything else other than Adventurer Rings can stack. Hmmmmmm……can the jumpstart dual blades in GMS (the ones that start at level 50 that you can create when you have a level 70+ character) get the free mastery books when they start? Sorry if you were asked this question already, but I’m too lazy to look through all the comments lol. I don’t have the answer to that question. I was wondering too. I guess we’ll have to wait till Chaos to find out! I have a dire question: If I have 6 points in Chains of Hell before Chaos patch, will I automatically get 6 points in Phantom Blow? No, it will just be SP. You’ll get an SP reset scroll anyway. Good question. KMS doesnt have Mastery Books for Evans so I didn’t even check. I need to double check the WZ first and then tell you (got to go now, I’ll check in about an hour). Just in time for all the GMS players! would you recommend making a character to 40 pre-chaos or make a character post-chaos from 1-80? P.S. is the blacksmith profession able to make thief shields such as the khanjar and dragon khanjar? because as of now i think they are gacha exclusive. and thanks for the all the effort you’ve done putting this together. No, but they can make a Deimos Shadow Shield. Level 120, +10 LUK, 7 slots. Not as good, but at least you can get it. How difficult is it to get to level 10 jewel crafting during the event, without any preparation? Is this something the common player could pull off? No it’s not; it’s not easy at all. You need a lot of hard work, tactics, and dedications to get it to level 10. Lol, sounds fun. So it definitely IS possible without preparation, you just need to no-life it? What I’m talking about is finding the ores on mining mules, instead of pre-buying the plates. Yeah that’s what I’m encouraging people to do. Is it more beneficial to get a character to lvl 40 pre-chaos or a character from lvl 1-80 post-chaos for the perks as a newly created character? In simpler terms, are the benefits of a newly created character worth it? Also, with the blacksmith profession, since you can forge shields, is it possible to make thief shields, such as the khanjar and dragon khanjar? As of now, these shields can only be obtained through gacha. Would you mind checking the Aran’s changes again? I find it’s hard to believe that Arans get 20 wa boost every 10 combo instead of 2. I also heard that the 35% damage boost for snow charge is still there(but it went passive, not when you active the skill). Yeah I really gotta check that over. Final Toss’s command was also changed, gotta make all those changes. annnnnd this seems so overwhelming all this stuff, but it seems to me like this event gives unfunded people a chance at making nice equips am i right? The DB actually wins. And yep you’re right about the unfunded people becoming rich. Did you see anything in the patch notes regarding the equips that any of the jump start characters receive? Nope, I’m going to try it though. Just don’t know what job of character to make. Hey Shakar! Are any of the accessories (Like the Angelic Blessing Ring) that you can craft tradeable? Yes, untradeable once equipped though. Wait so, the new Lillin Ring, new Resistance Ring, and Adventuring can be stacked together? will the cash items from boom up be permanent? but i have a little question…. And which profession did you choose for your maine? You can get those recipes from monsters. Actually, the 140 equips are sold by Larson in PvP (a few patches after the Ice Knight patch). I chose Mining + Accessory Crafting, the classic. Lastly, I level’ed up my Thunder Breaker from 47-87 for the earrings and Dual Blader from 1-80 and attempted to level an Aran. I made a mistake though, I was overexcited about Arans. I should have leveled up an Evan instead, much more useful reward. Hey Shakar, nice guide but would u mind telling me if when u create a character from the jumpstart event will u still be able to get the rewards from the boom up event? Oh and do u need any free character slots to make a jumpstart character becuz u get one for free or is the free slot after u create ur character? You don’t get the Boom Up events stuff… You don’t need a free character slot, you’ll get one! Heya, just had a brief flick through (mainly events) but just wanted to say thanks. It looks like it took a long time, keep it up! I was like planning to come back to maplestory when Cannon shooters are released. But are there things I should do in Chaos before having my long ”brake”? Do you know if any 2 of the Adventurer’s Rings will stack? Exactly what I wanted. Thanx SHAKAR96!!!! Awesooooooooooome guide! Thanks so much for this! You kinda skipped Aran/Evan 😦 I was looking for Aran and I cursed out loud and my gf yelled at me cuz her little sister was near. In conclusion: Add Arans! theres is aran/evan. page 2 or 3 idk. Do you know if the new db mask and evan glasses are potentialable? No slots = not potential-able? For the lvl 140 weapons, when they are made do they need the platinum sok? Or is it only when equipped they need it? sigh, mechs really take a hard hit with tank mode using mp to attack and bots n tots losing so much power. I must say, you have great quality in your guide and I respect what you do. The new adventurer rings can’t stack with old job items like the lvl 100 DB mask right? So piggy backing on his question my bm has adventurer ring, sair has one as well, and drk has lilians ring. So if i get the blood mask, none of them can wear it, correct? Uhh no, they can wear it. Ring + DB mask stack. Ok thank you, i was getting so many confusing answers everywhere and im happy it was the way i 1st thought which made the most sense. Thank you. What if I want Dark Angelic Blessing(Which gives the effect with the 2 girls holding somehting right?) and Deluxe Android (M/F) Recipe & Iron Heart Recipe/ Android (M/F) Recipe & Silver Heart Recipe, what do I need to do to get those? I would need mining and accessory crafting tight? why did they r@pe blaze? They made it only 260% on 1 mob… It’s basicly a 1 hit magic missle 0.o did you typo or did they seriously do this, and would u know why? I have heard that high level accessories require SoK or PSoK to trade, do the level 140 and 130 gear have that restriction as well? If that is true, I wonder what profession would be more beneficial to my main… So Shakar, is this true? Thank you so much for your work on bringing detailed posts on new updates, Shakar96. Keep up the good work! Which Means , everything that is “NEW” can stack? For Example, I have all the Equips above and do all of them stack? -Updated,- Check it out again. Thanks for the guide. Very informative and helpful! So , there won’t be dragon khanjar recipes? Seems according to the Nexon website that the Fatigue Restoration potions will only be on sale for NX o.o; What a let down! why didnt i find you when i was wasting my time reading spadows blogs? these are way better and in much more detail. just your lay out needs some work and youll be awesome!!! can you explain more when you said : “Yay! Well anyway, once you learned a recipe it’s yours forever and you can make it as many times as you want (with some exceptions! Read on!)”. What are the exceptions? If I find an android or shoulder pad recipe, I can make it more than once? I was under the impression you need another recipe each time. Some recipes say ‘one time use’ on it. Those are the exceptions. Others will say multiple use, so you can use them as many times as you want. Most shoulder pad recipes are multiple use, Android are not though. The one you get at level 4 is 1 time use, and then one you get at 10 can be used 10 times. Just so you guys know. At lv4 of jewel making, you don’t get Angelic Bless ring recipe. :[ I’m lv4 for my jewel crafting and yet nothing! WTF Imps arent useless….. It’s called feed it ETC items. -.- They give you better pickaxes/shovels, special lvl 90 weapons and also mineral/herb bags that holds up to 8 slots. This is so useful in saving etc room. Thy changed in GMS, in KMS you had to feed it equips and the rewards were bad. Hi Shakar, Could you post up the required materials for dark angelic ring? I’m on TWMS and I just got the angelic ring at lv4, I’d love to know what you need at lv 10 so that I can start preparing ^^ thanks!!!! hey do u know by any chance if Demos Slayers use W.ATT OR M.ATT? i really wanna know..